When Jonathan Koop of Shellrock, Iowa, visited the folks at M&G Tire in Ackley, Iowa, he wanted to increase the traction and flotation of his high-horsepower tractor. 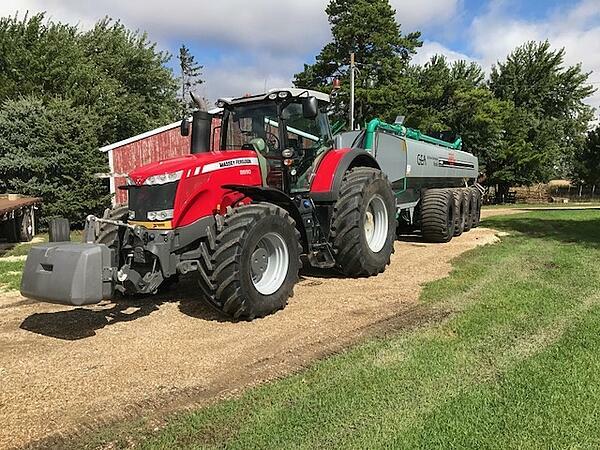 Jonathan was using a 400+ horsepower, front-wheel assist Massey Ferguson 8690 tractor to pull a giant Houle manure tanker, and assumed that he would need the largest possible tires to achieve results. Originally, Jonathan was looking at 1000/40R32 tires for the front of his Massey, and 1100/45R46 tires for the rear. These tires have enormous air chambers—too big, as it turns out, because even when inflated at their minimum air pressure of 6 psi, the tires were rated to carry more weight than Jonathan’s tractor and tanker would exert. When a tire is working at the low end of its allowable air pressure range and it isn’t carrying enough weight, it isn’t flexing in the manner for which it was designed. The tire won’t squat correctly or lengthen fully to express its optimal footprint on the ground. This leads to everything from a loss of traction to faster wear. Operating over-sized tires at their minimum tire pressure also often results in increased soil compaction (the underweightedness of the machine causes a smaller footprint which results, ironically, in disproportionately increasing downward pressure per square inch on the ground—even though the pressure inside the tire remains static at 6 psi). What M&G Tire and I set out to find for Jonathan was a tire that would operate at the nominal, or ideal, air pressure. All tire companies operate from Tire and Rim Association (TRA) approved load inflation tables when listing the specifications of a tire—this is how tire manufacturers recommend air pressures for a specific load condition and speed of operation. The load tables are unique by size and construction (bias, radial, IF, VF), and they all have a minimum allowable pressure. For example, the minimum air pressure allowed in any brand’s IF800/70R38 in a single configuration operating at 25 mph is 12 psi. At this pressure, the tire will carry 10,780 lbs. If you do not have at least 10,780 lbs of weight on that tire to justify the minimum of 12 psi, then you have too much tire on the machine and the IF800/70R38 is over inflated. In a case such as this, the next step is to start looking at tires with a lower minimum load requirement but a very similar rolling circumference, such as a standard 800/70R38 or a 620/70R46. With that in mind, M&G Tire, Jonathan, and I dug out a pen, paper, and calculator (essentials for calculating proper tire pressure) and got to work finding a tire—and tire pressure—that would work for the tractor. 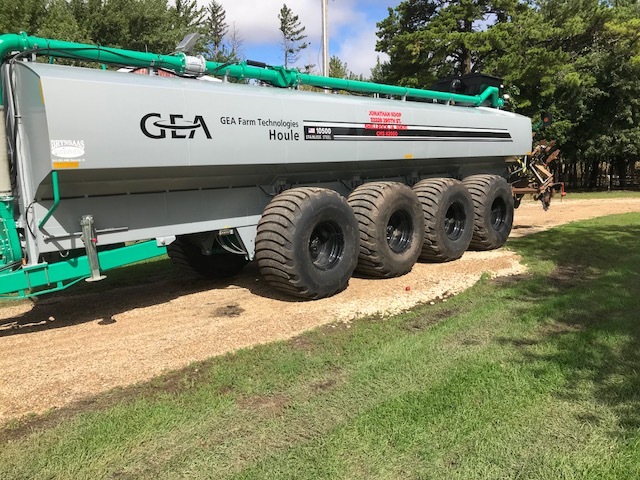 We settled on the Alliance Agriflex+ 372 tire VF600/70R30 on the front and Alliance Agriflex IF800/70R38s on the rear. And, after running the numbers, we set the tires to 17 psi in the front and 15 psi in the rear. As it’s currently configured, Jonathan’s tractor tires are now set to operate at a nominal air pressure. It often gets lost in the conversation, but the footprint of a tire like our Alliance 372 is approximately the same at 7-10 psi as it is at 23 psi, providing that those pressures are correct based on the load. It’s also worth noting that this package cost $8,000 less than what Jonathan was originally looking at—a gigantic savings, and that’s before beginning to reap the benefits of tires being operated at a nominal air pressure. When it comes time to shop for your machine’s next set of tires, we urge you to resist the temptation to simply choose the largest possible option. Sit down with your tire dealer to calculate the minimum weight of your machine (front and rear) and then work with the TRA charts to identify the best tires and sizes. Remember, when it comes to farm tires, bigger isn’t always better. Before joining Alliance Tire Group, Dallas spent a decade working for the Graham Tire Company holding a variety of sales positions, including Sales Manager. During his tenure with Graham Tire, Dallas helped build and promote the Alliance brand through their associate dealers and local end users.